On October 23, 2015, Professor WU Ji, director-general of National Space Science Center of Chinese Academy of Sciences (NSSC) and chair of the Board of Trustees of the International Space Science Institute-Beijing (ISSI-BJ), and Professor Rosine Lallement, representative and vice chair of the Board of Trustees of International Space Science Institute (ISSI) in Bern, Switzerland, signed a new agreement, which confirmed the cooperation of two sides on continuation of ISSI-BJ for at least three more years. ISSI-BJ was established according to the Memorandum of Understanding (MoU) which was signed on February 14, 2012, and the Agreement of Cooperation (AoC) which was signed on July 15, 2013, between NSSC and ISSI. According to the MoU and AoC, ISSI-BJ uses the name, logo and existing tools, including Workshop, Working Group, International Team, Forum and Visiting Scientist, for advanced study where scientists from all over the world meet in a multi- and interdisciplinary setting to reach out for new scientific horizons. The main function is to contribute to the achievement of a deeper understanding of the results from different space missions, ground based observations and laboratory experiments, and adding value to those results through multidisciplinary research. ISSI-BJ also shares the same Science Committee with ISSI, which evaluates and proposes the scientific projects to be implemented in ISSI and ISSI-BJ. From February, 2013, ISSI-BJ began the preliminary operation and was officially inaugurated on July 16, 2013. From then on, ISSI-BJ had organized eight forums dedicated to the deeper discussions on the science and international cooperation of eight candidate missions of the Strategic Priority Program on Space Sciences. It also organized one joint workshop with ISSI and one workshop independently, on the frontiers of planetary science and space-based astronomy, respectively. The output of the workshops will be published by Springer as the Space Science Series of ISSI (SSSI), which had become important publications on space science with high quotations in the space science communities. In addition to the forums and workshops, from 2014, ISSI-BJ released joint call with ISSI for international teams and there are 11 active teams working in ISSI-BJ up to now. During its more than two year operations, ISSI-BJ had attracted about 500 scientists and visitors from all over the world. According to the 2013 AoC, a brainstorm forum on the strategy of ISSI-BJ was held in November, 2014, and a international visiting assessment committee was established to evaluated the performance of ISSI-BJ. The international visiting assessment reports gave ISSI-BJ a good credit and concluded that ISSI-BJ had a good start and had been gaining good reputations from the international science communities. 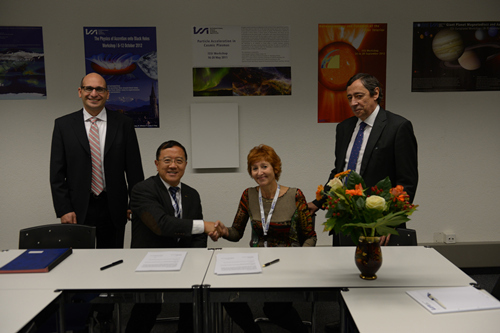 Based on the evaluations, NSSC and ISSI agreed to continue their cooperation on ISSI-BJ. The Board of Trustees of ISSI-BJ and ISSI approved assessment report and the new agreement in April and June, 2015, respectively. According to the new agreement, the cooperation will last for at least three years and after the specified period of three years, the agreement can be extended or a new agreement will be signed to continue the cooperation. This new agreement ensures the continuation of ISSI-BJ for at least three years. Based on the agreement, ISSI-BJ had formulated the Strategic Guidelines and the Implementation Plans for 2015-2018. During the future three years, ISSI-BJ will implement 1-2 forums, 1-2 workshops and 4-6 international teams per year, and begin the working group projects according the demands. According to the outputs of the brainstorm meeting, ISSI-BJ will increase attentions on the mining of Chinese space science missions to maximize the science achievements.